There are 5 Elements to an Agile Classroom. This post will describe the Fifth Element, 'The Journey'. Growing an Agile Classroom where students are learning iteratively in self is a journey. In any journey, it is useful to have a map. Just as map uses the degrees of latitude and longitude, an Agile Classroom uses the degrees of collaboration and empowerment. At the intersections of collaboration and empowerment, a map is created composed of four different Agile Learning Zones; (1) Traditional Learner, (2) Cooperative Learners, (3) Independent Learners, and (4) Self-Organized Learner Teams. You can use the four Agile Learning Zones to design the learning environment fit for your context and to scaffold your classrooms journey to greater agility. In each zone the Visible Classroom and the Learning Rhythm are used to support learning in that zone and to scaffold the classroom to reach their next shift. In following posts, each zone will be described in more detail and how to use the Agile Learning Zones to chart your path. Thank You for your contribution to the Agile Classroom community. 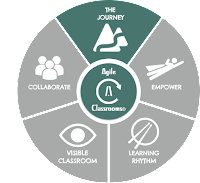 Agile Classrooms© 2014-2015. Simple theme. Theme images by merrymoonmary. Powered by Blogger.